Talon like never before. Bold and beautiful. All material, all speed. Created with Android Lollipop and Material Design at it's center. 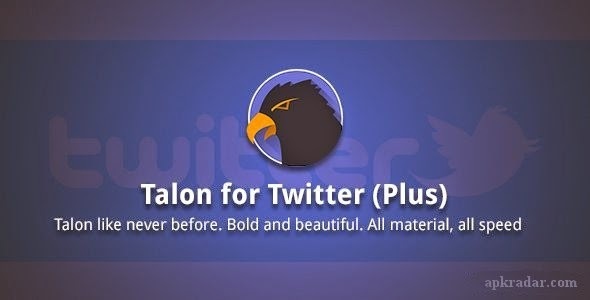 Talon (Plus) includes stunning and beautiful layouts, eye catching animations, the smoothness you should expect from the latest and greatest apps, plus so much more. This isn't the Talon of the past, it has been fully rebuilt around Android 5.0 (and is only supported on 5.0) to give you the most power, speed, and style possible. You have never experienced an app like this before. 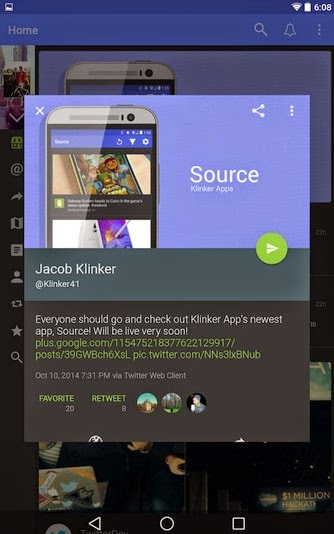 You won't even be able to think about going back to your "Holo" Twitter app. - And many other goodies in there as well! You will never go back to your old Twitter client again! Android has built in support for emojis, but if you want the iOS style, just download this plugin and apply them from advanced settings. 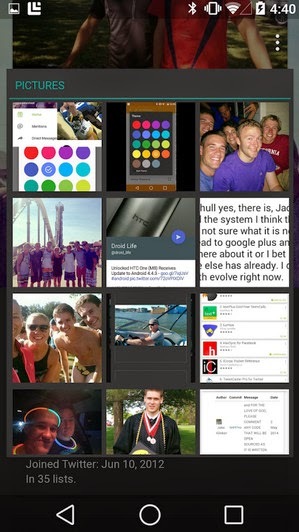 - Write to Storage: Saves pictures to your SD card and writes them into the cache. - Read from Storage: Used when backing up settings. - Location: Used for trends and attaching locations to tweets. - Network State: Used so the user can toggle background sync to only over WiFi. - Run at Startup: Re-schedules the background refreshes. - Keep Awake: Used for background refreshes and waking the screen. - Vibrate: Used for the notifications. Please remember that this is for Android 5.0+ only!